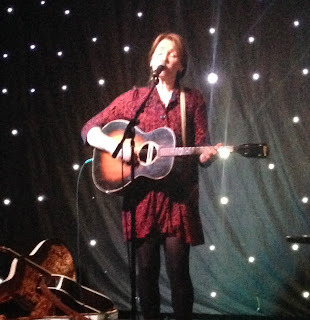 Diana Jones was first caught live when playing a sold out show at the Kitchen Garden Café in Birmingham around the time of the release of her second main album BETTER TIMES WILL COME. Praise and acclaim had just started heading in Diana’s direction over here with her stunning show backing up this adulation. Subsequently Diana did return to the city for another show on a later tour and her sets were also immensely enjoyed at Shrewsbury Folk Festival and when the Big Sessions used to be held in Leicester. Now fans new and old of Diana can re-live her live magical experience via the LIVE IN CONCERT album being released on Proper Records in February. The simple title of this release signifies Diana’s straightforward approach to music where often only an acoustic guitar and a voice breathing the Appalachian air is sufficient to convey the lyrical sophistication of her song writing. Of course it was not always the Appalachian air that supported the life of Diana Jones as was widely documented when she explained the family awakening discovered on a spiritual journey from suburban New York to rural Tennessee. Over the last decade she has fully come to grips with exploiting her genetic talent and this new release captures it most splendidly. The danger of re-issuing many old songs is adding value for those who already have Diana’s back catalogue securely in their record collection. There are three new tracks subtly finding a recorded version for the first time which partially paves the way. You can check out ‘My Last Call’ in advance via a You Tube video along with the other newish songs ‘Happiness’ and ‘Prayer for My Brother’. The only other song fans may not be familiar with is ‘Rain and Cold’ which only appeared as bonus track on certain versions of HIGH ATMOSPHERE. The jury can often be out on the worth of live albums as to whether they actually succeed in transferring a listener’s mind to the engrossing atmosphere of a venue setting. Essentially the substitution will always fall short so other redeeming features need to be sought. The eighteen tracks which have been captured for Diana’s live album come across as pristine recordings and closely resemble the studio versions. Although it has already been mooted that such is Diana’s organic approach to music, there is often only a fine line between the versions of her songs. While fully committed Diana Jones fans will instantly snap up the album, more casual observers will have to weigh up the pros and cons of such an investment as we wait for her next batch of new original songs. However if you are quite new to her music, this record will be the ideal introduction as it conveys a real feeling of what Diana Jones does best. It is packed with all her popular tunes including the beautiful ‘Pony’, the tearful ‘Henry Russell’s Last Words’ and poignant ‘Appalachia’. My personal favourite version on this album is the sublime ‘Drug for This’. There is a heavy bias towards the pair of album released in a period where her career was taking off namely MY REMEBRANCE OF YOU and BETTER TIMES WILL COME. Hopefully this does not reflect that the best of Diana Jones is behind us, just a momentarily look back at a time where the recognition came pouring in. Diana Jones has been a frequent visitor to the UK and Europe to fluctuating degrees over the years and returns for an eight date tour in April where the songs from this album will no doubt be showcased. Attending one of Diana’s shows is highly recommended, but if the limited coverage does not extend to your area, the perfect substitute lies in this record. 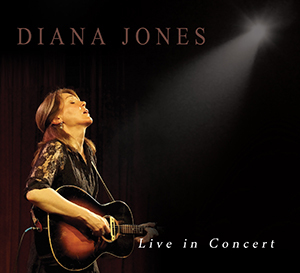 LIVE IN CONCERT may not quite replace the real thing but it achieves its goal of presenting what Diana Jones is all about.